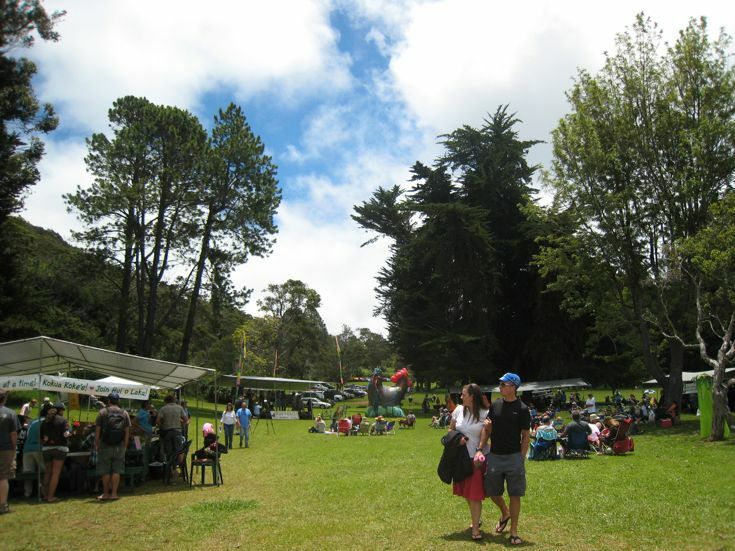 It’s a forest education fair for the whole family with a funny name – the Banana Poka Round-Up! An invasive pest from South America, the Banana Poka vine, with its gorgeous bubble-gum pink blossoms, is the “poster weed” for this zany annual event. It is just one of the many threats to the health and diversity of Hawaiian forests – and also a fabulous craft material. The Round-Up always features a huge tent where you can learn how to make a basket out of the pest. Held in early summer, May 27, 2012, in Kanaloahuluhulu Meadow, the event features basket making, great live music, exhibits by organizations and agencies that work to save the environment, along with lots of activities for kids – face-painting, hiking, painting from nature, as well a walking stick from guava saplings. Right after the Memorial Moment and Pedal to the Meadow Biking winners, a Crowing Contest is held – everyone from little kids to adults join in! Sponsored by Hui o Laka since 1989, the 23rd annual Round-Up includes several new features, including being the finish line for the second annual Pedal to the Meadow bike race, a Kekaha-to-Kōkeʻe race that begins at 7:00 am Sunday morning. Kōkua Kōkeʻe (Hui o Lakaʻs stewardship program) is looking for new members so it will be able to grow into the first ongoing (as in year-round and continuous) natural resources management program that is NOT funded by government. They want to expand this forest ʻohana before their 60th anniversary and dedication of the CCC Camp in 2013!